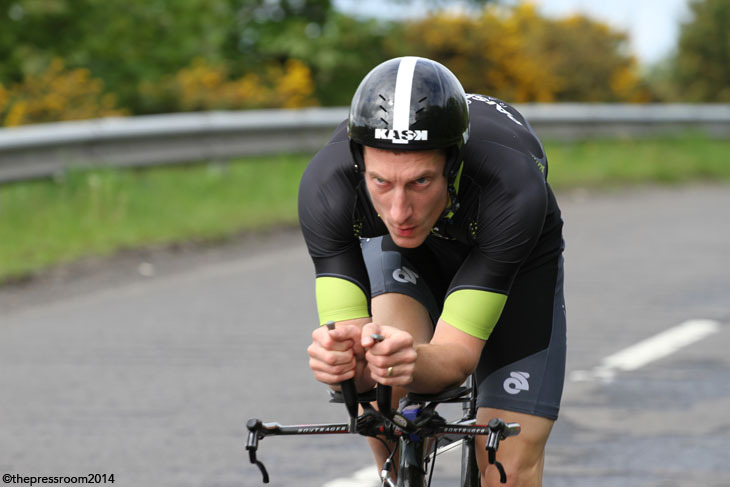 Summer came early this year with some nice days in April but it was back to usual conditions for the Scottish National 10 Mile Time Trial Championships at Irvine. The times were fast though and the performances impressive. As I headed towards Irvine for the start of the Scottish National 10 Mile Time Trial Champs I was keeping a wary eye on the lowering cloud base, in the hope that I might get one of those all-too-rare windows of opportunity. I just wanted a couple of hours, three at the most, but the tv weather forecaster hadn't been confident…and neither was I. Coming through Dalry and Kilwinning the roads were wet but it wasn't actually raining. There was no sign of any blue in the sky though. 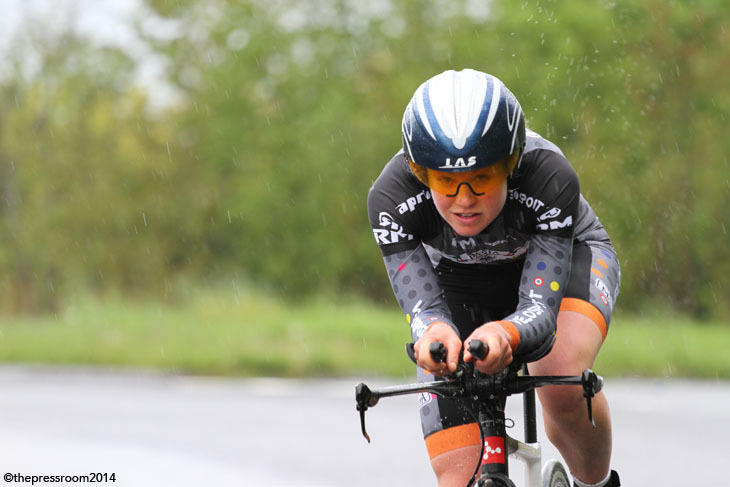 Sure enough, just after pulling into the car-park at Eglinton Country Park, and heading over to the sign-on desk to get a copy of the start sheet, the big drops began to fall again…not too heavy at first but that kind of rain that you just know is going to continue. So, waterproofs on and cameras wrapped in rain gear, I headed off to the start where the timekeepers were just getting ready to send the first woman on her way. As a photographer taking pictures on an out-and-back course, especially when it involves separate on and off-ramps, and with 160 riders to cater for, the challenge is always to find new, interesting and varied ways of taking those shots…or else you just end up with 160 copies of the same photograph where only the rider is different. So I shot some at the start, first roundabout, first on-ramp, on further down where the carriageway splits, and on up to the first flyover. Most of the shots are on that first on-ramp because once the last man has gone it allows me to get across to the off-ramp on the other side to catch the riders once they've finished. I've shot there before (the season-opening Icebreaker TT) and it's a great place to see the relief on the riders' faces, knowing that the effort is over. Last time there was chatting, laughing and the beginnings of analyses of the ride. But yesterday was very different. It was indeed the race of truth, with nowhere to hide and the competitors that I saw had given their all. Most people will know the man that ran out the victor yesterday and you'll know that Iain Grant is the most approachable rider, always happy to say hello and have a chat, always ready with encouragement for other riders no matter what level they're at. He always makes a point of acknowledging me but as he passed me yesterday I don't think he was even aware I was there such was the effort that he'd given. 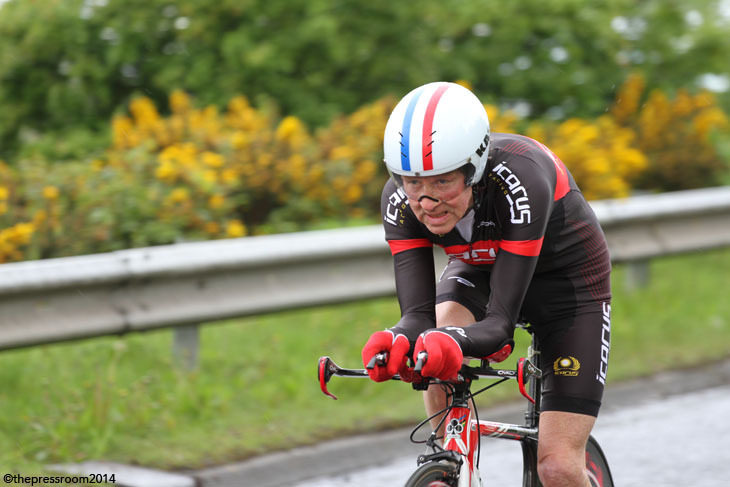 The sweat was pouring from under his aero helmet and running off the end of his nose. He wasn't the only one who had pushed to their limit: Arthur Doyle wiped saliva from around his mouth but still managed to give me a wave, Gordon Murdoch stopped halfway up the ramp to take a breather, the Berwick Wheelers duo of Christopher Isats and Harry Armstrong didn't look over and Alan Thomson could do no more than stick his tongue out at me. I respect all of these riders but my personal empathy was with Silas Goldsworthy. Most of you will know that Silas had a bad injury a short time ago and while he's largely recovered from that, he's lost valuable training in the meantime. All credit to him for turning out yesterday and although his time of 20:17 was good enough for 5th place on the day it wasn't the result he was looking for. 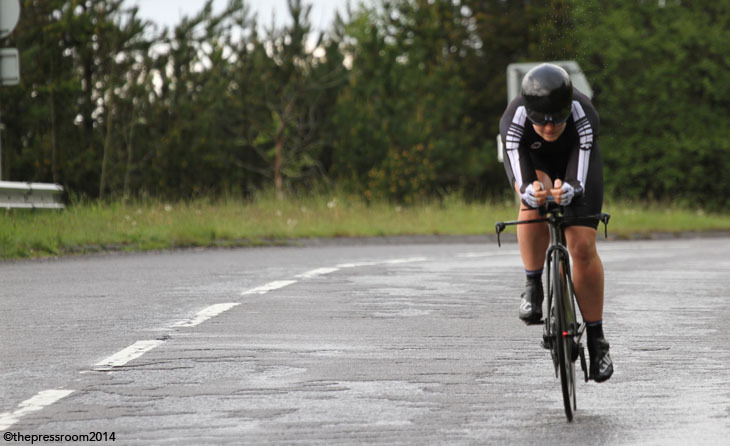 Now, the Scottish cycling community may appear like a closed shop to those who aren't cyclists but that just isn't the case…and all of these riders, while being fiercely competitive, are also very friendly towards each other. Silas is his own hardest critic and he stopped just after he'd passed me to take a moment. A bit of time to think about all the hard work he's put in over the years and how the injury may have happened at the worst possible moment. The last man to finish was Ben Peacock and he sportingly stopped to console Silas. At that point I headed back to event HQ to find out how everyone had got on. Here's how it played out. The first 75% of the field got the worst of the weather with the Women, Juniors and Youths setting off into light rain and drizzle. 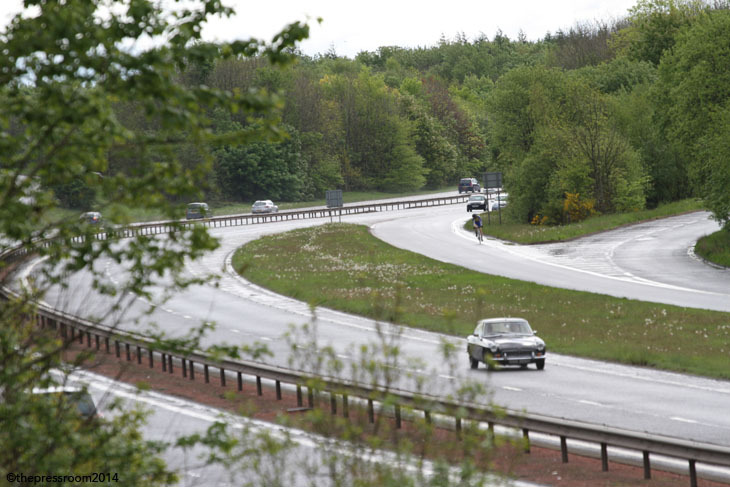 While riding in the rain can often feel faster, especially when there's no real wind, there are drawbacks and lots of bikes were sporting rear flashing lights as they disappeared into the dual carriageway spray long before they would normally have been out of sight. 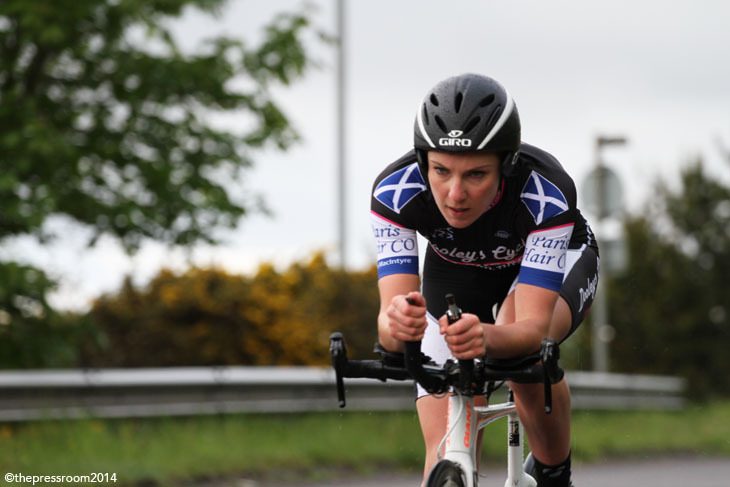 In the Women's race the quickest of the early starters was Toni McIntosh (Ayr Roads CC) who returned to the timekeeper in 23:36 and this was good enough for 4th place on the day. 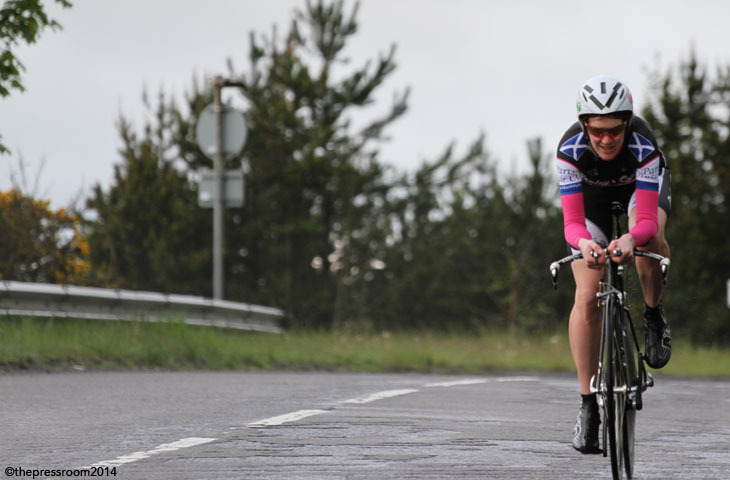 The next rider to come close was Jennie McColl (Aberdeen Wheelers CC) in a time of 24:36 (8th on the day) but this was beaten a few minutes later by Anne Ewing (WV Breda) in 24:26. Less than two minutes later, one minute 59 seconds to be precise, Lynne Wardrop (Ayr Roads CC) came home in a time of 24:25. This gave Wardrop and Ewing 6th and 7th spot when all was said and done. Next up, and from a relatively small field, were the Juniors and Youths. 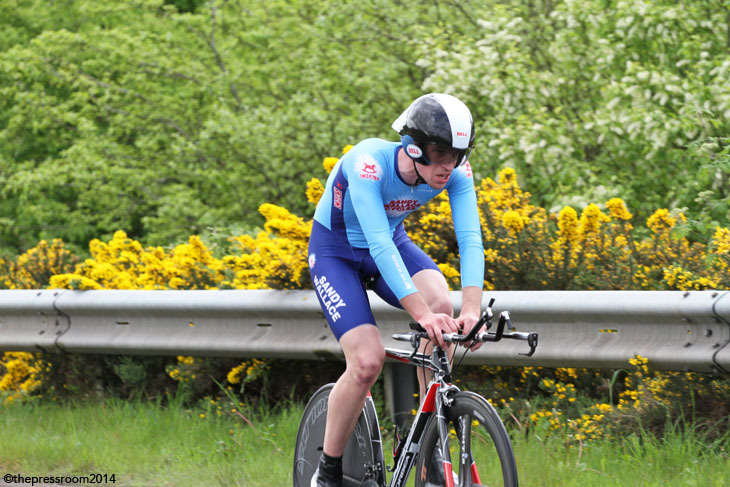 Gold in the Juniors event went to Angus Claxton (Moray Firth CC) in a very impressive 22:06 which made up for the long trip south. 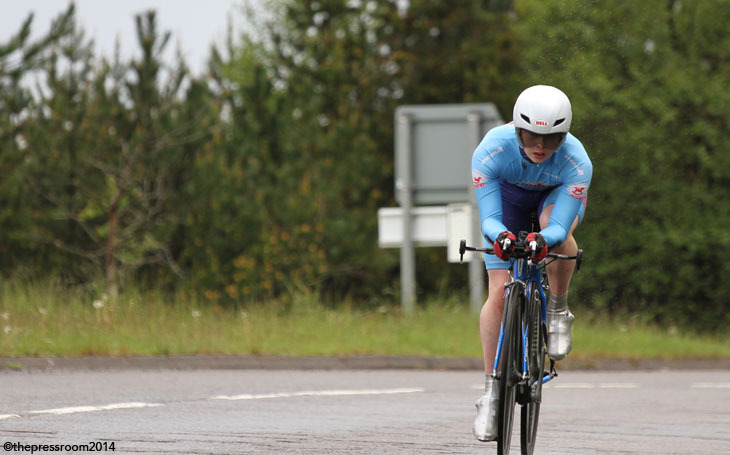 Best position in the Youths event went to Stuart Turvey (Sandy Wallace Cycles); just inside 24 minutes in a time of 23:59. Certainly names to watch for in the future. Now it was the turn of the men and it was at this point that the weather, which had eased off a bit, decided to take a turn for the worse. 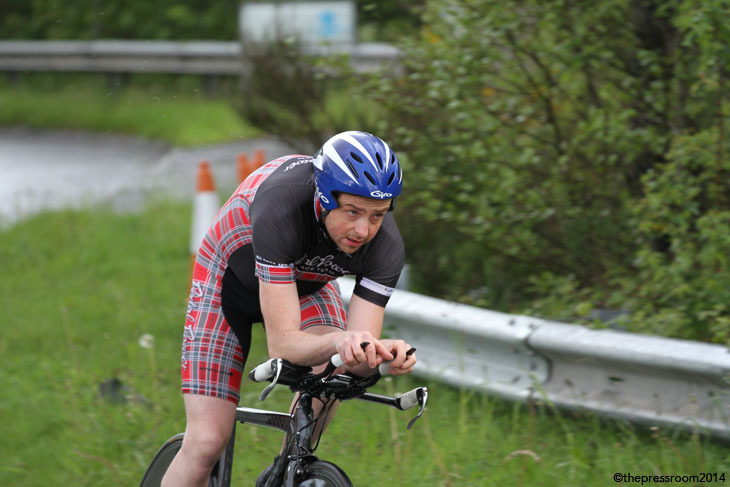 Albert McLellan (Glasgow Couriers) headed out in determined fashion (the marshal next to me said "I take it that's the end of the Youth event then") but he was quickly followed by Alastair McGibbon (Ayr Roads CC) who was looking more determined than I've seen him. 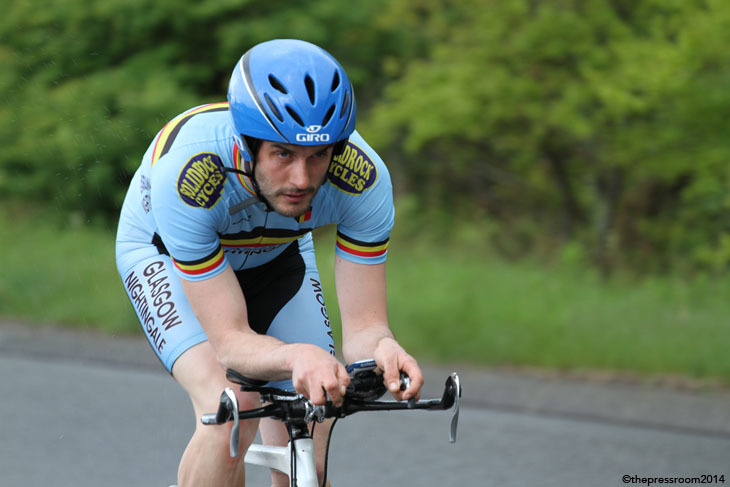 He would catch McLellan, the former 12 Hour and Hill Climb champ before the turn but an impressive performance from the veteran rider nonetheless. 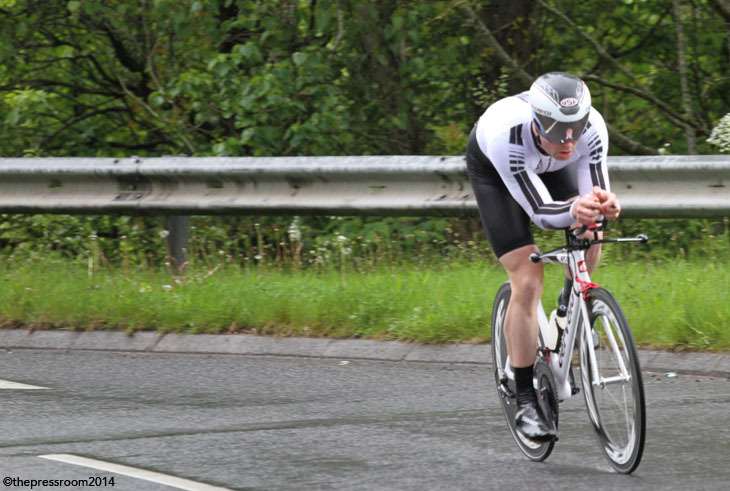 First rider to come home in under 22 minutes was the 5th man off, Sean Gray (www.Dooleys-Cycles.co.uk) who posted 21:49. He wasn't alone in that from the first 50 riders there were 14 who made it in under 22. By this time the weather was beginning to ease once again and by the time that another 25 riders had passed me the roads were virtually dry. Traffic had increased a bit but on a course like this that's more often a benefit than a hindrance. 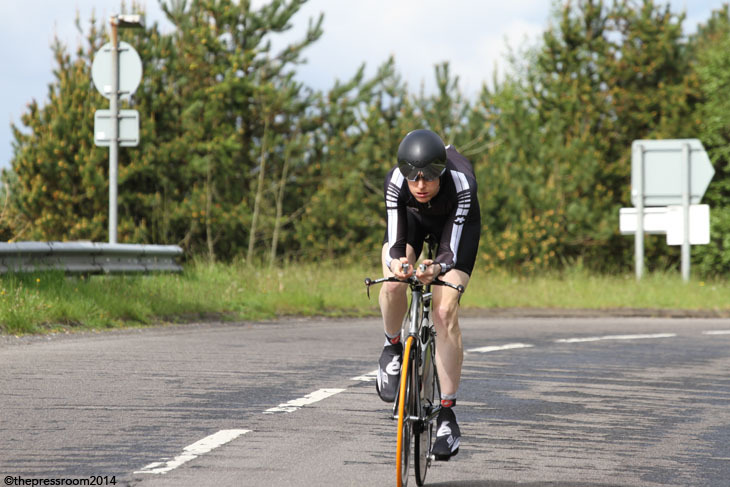 With just over half the field still to ride we had our first sub 21 ride and once again it came from Dooleys Race Team with Nick Tryon coming home in 20:20. This held top spot for almost an hour and a quarter and was good enough to see Tryon as part of the winning team. 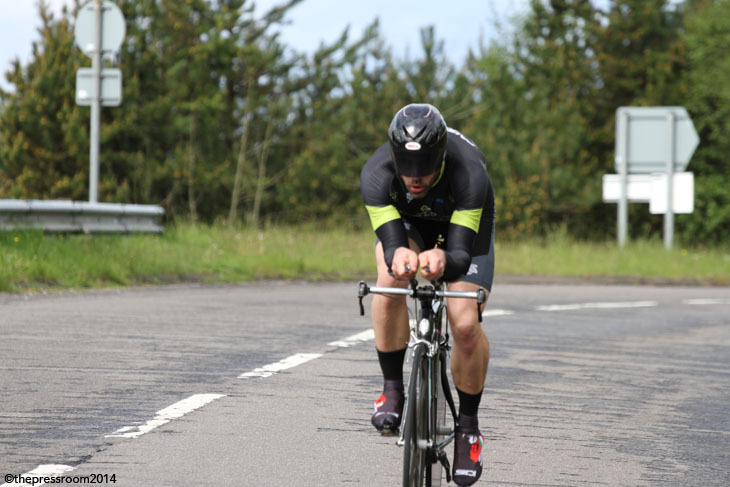 Eventually it came down, as it always does, to the men who have consistently proved themselves against the clock and the first rider to better Tryon's time was Chris Smart (Paisley Velo RT) the recent winner of the Jason MacIntyre Memorial TT who finished in 20:16. 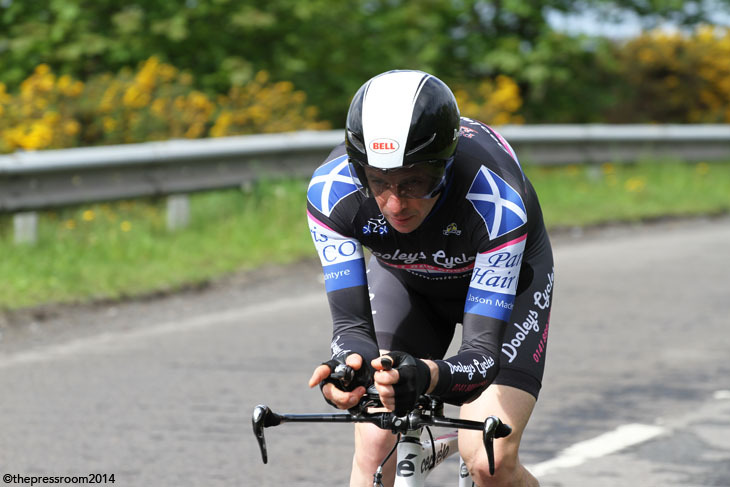 Alan Thomson (Sandy Wallace Cycles) came close in 20:41 as did the Berwick Wheelers duo of Christopher Isats and Harry Armstrong who recorded 21:04 and 20:59 respectively. 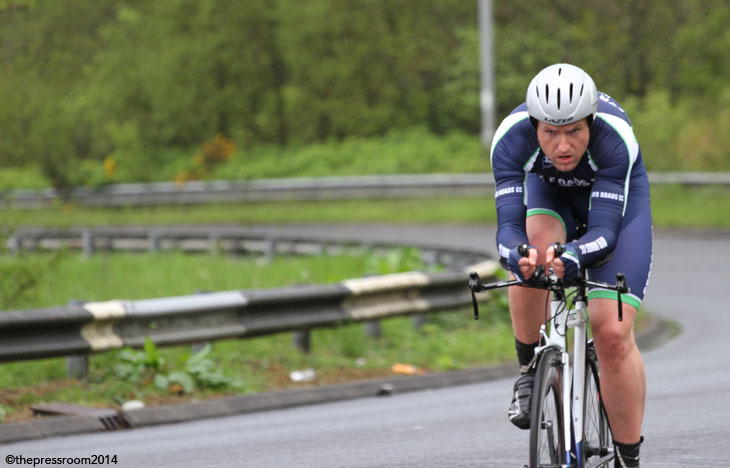 It was all down to the last four riders and as they headed out onto the first section of dual carriageway they were all looking super-fit. Arthur Doyle (www.Dooleys-Cycles.co.uk) is a big guy but he still manages to adopt a very aero position on his Cervelo and wearing an all black Assos skin suit he really looked like he meant business. 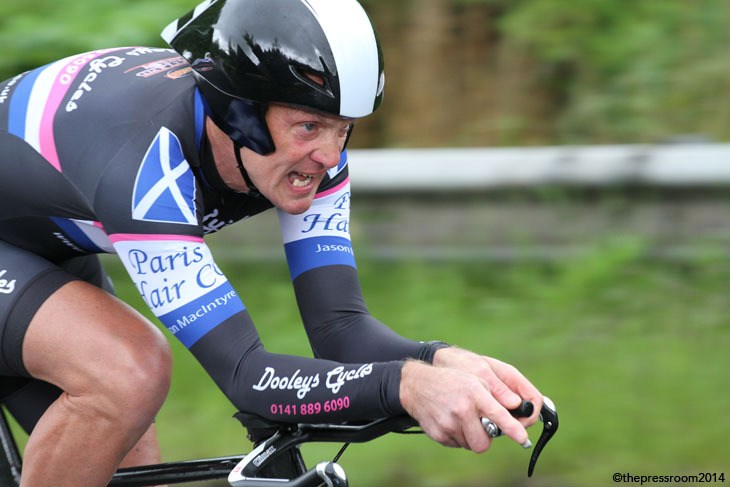 Next up was Iain Grant (www.Dooleys-Cycles.co.uk) who always has a very focussed look but a seemingly stress-free pedalling style. 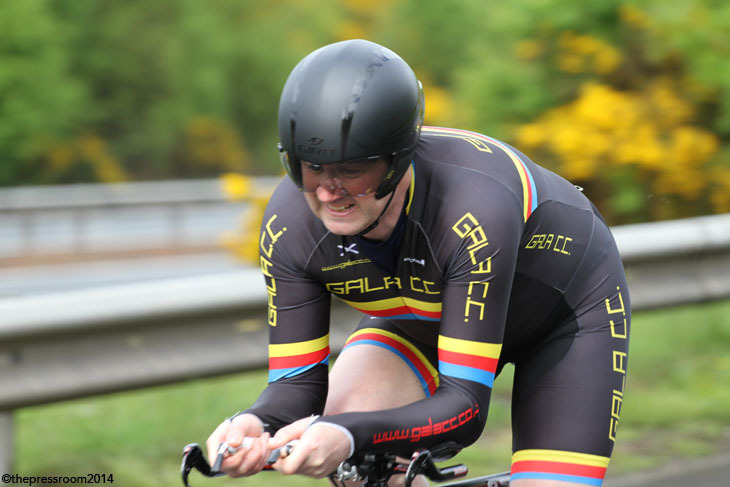 Then Silas Goldsworthy (Sandy Wallace Cycles) who outwardly looked as if he'd completed recovered from his recent injury. Last man up was defending champion Ben Peacock (Paisley Velo RT) who looked almost relaxed as he fired down towards the main carriageway. Not having a clock on the riders I headed round to the off-ramp and picked them up as they finished. Arthur Doyle looked like a rider that had given pretty much everything. It was difficult to call between him and Iain Grant and Grant passed me in what felt like two minutes later but I then had to wait a little longer before I saw Goldsworthy and as he stopped at the side of the road it was definately not another two minutes before Peacock rolled up beside him. By the time I'd reached the event HQ and gotten rid of the wet-weather gear, the times had been just about confirmed; Iain Grant had retaken the title in a time of 19:40 followed by Arthur Doyle in 19:55 with Ben Peacock at 19:59. Chris Smart took fourth spot in 20:16 and Silas Goldsworthy finished fifth in 20:17. 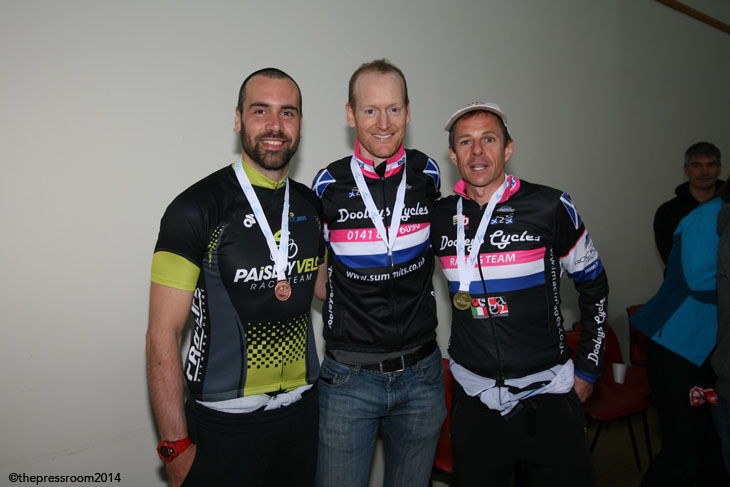 Dooleys Cycles took the Men's Team prize (Grant, Doyle and Tryon) to add to that of the Women's so all-in-all an excellent day for the club from Paisley. Once again, another excellent event organised on what the new champion believes to be the fastest 10 course in Scotland. The team at Glasgow Couriers put on a top event and the inclusion of a coffee tent at the start courtesy of Cafe2U was a nice idea. Full gallery of photographs will be available on our Facebook page where we'll also post the complete standings.